practical nature are little further "advanced. Overhanging Hedges - Owners of properties where hedges are overgrown and overhanging the pavements are to be requested to trim them back. These hedges are definitely dangerous, especially during periods of darkness. Cycling on Footpaths.-The Association has received many complaints recently from residents who have been endangered by cyclists riding on public footpaths. This is a very dangerous practice and all residents who witness such occurrences are requested to take some positive action. School Heads and Club Leaders could undoubtedly do much to assist in this respect as many of the offenders are teenagers." there is a reason for all decisions as this is a matter of public interest, it is worthy of the closest examination. Common Moor -The question of this piece of land being used for recreational purposes to fill the need for more football pitches, is to be reconsidered.. Unfortunately, the Chancellor's ruling on expenditure on recreation grounds may delay any positive action. CROXLEY GREEN (SOUTH). Groves (C) 974, Boal (L) 8DO. MOOR PARK. No change. Peebles (C) 901, Foster (L) 43. WEST HYDE. No change. Gregory (L) 385, Hor ley (C) 239. MILL END. Labour gain. Hider (L) 1338, Mrs. Welch (C) 1108. TOWN. No change. 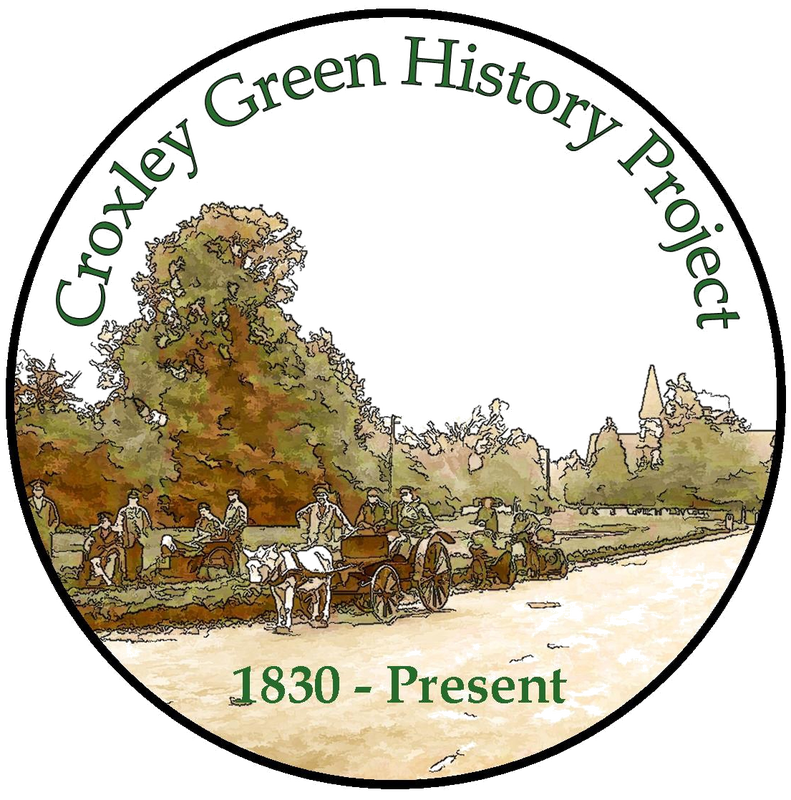 Pears (C) 928, Mills (C) 926, Gough (L) 379, Horne (L) 363.
keeping with the surroundings and it is hoped that those members of the public using the Green will in turn use the seat and reflect upon the purpose for which it has been provided. To all former pupils of All Saints' Girls' School, and of Harvey Road School, Croxley Green. Miss Cooper is retiring in July and would like to meet you at Social Evening's to be held in the School Canteen at 7.30 p.m. For those between fifteen and eighteen July 4th is the date, and Mrs. Fenton at Harvey" Road School would like to hear from yon by June 6th For those over eighteen-July 11th is the day, and Mrs. Ellard, 38, Yorke Road, would like .to hear from you by June 13th. whether the Council would support them in an endeavour to have the branch re-opened, working under a more economically balanced system. her new life when she joins her husband in Burma. 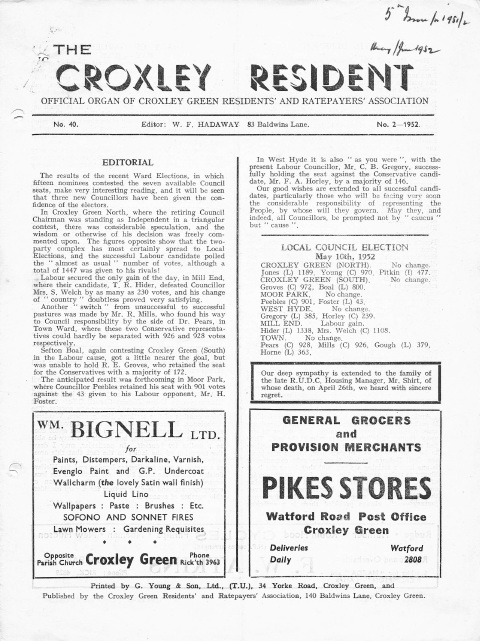 whether it is named " Croxley Green' or " Rickmansworth," or for that matter" Scots Hill," but let the name at least fall in line with postal and other considerations and avoid confusion. but it is unfortunately becoming more and more difficult for intending house-owner occupiers to build their own homes because of the high building costs and the difficulty in obtaining suitable sites at reasonable prices. The difficulty in financing these individual houses is becoming more and more noticeable. There is definitely a case for both central and local governments to assist would-be owner-occupier house builders to acquire the capital necessary to finance their venture and by so doing reduce the ever growing burden of subsidised building. The five approved pedestrian crossings in the Rickmansworth district are to have flashing lights installed as soon as is convenient. The estimated cost of installing flashing lights at a crossing with two beacons is approximately £40, with a maintenance estimate of £12 per year. The Council have conferred with the District Valuer on the question of compensation, in respect of the release of the former Civic Restaurant. 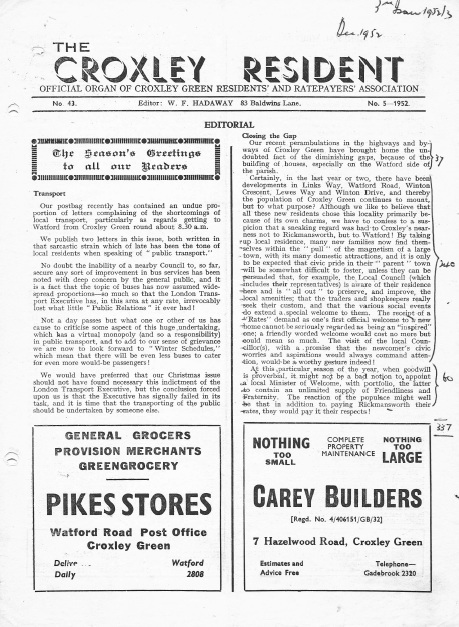 In one respect the clause in the constitution of the Croxley Green Residents' and Ratepayers' Association which decrees that the Annual General Meeting shall be held at this time of the year is to be regretted, as the accompanying weather has become almost proverbial. Those hardy spirits who braved the elements to attend this year's meeting were well rewarded and will have enough views and opinions of local government to occupy their thoughts for some tune to come. Dear Sir, I have never seen a conundrum in your magazine so why not use this one? 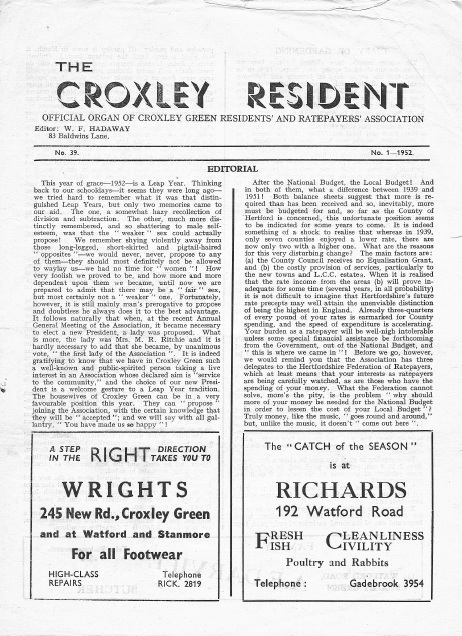 "If it takes a man thirty minutes to walk briskly from Croxley L.M.S. to Market Street, how long does it take to get on a bus about 8.30 a.m. and cover the same distance?" If you know the answer, break it gently to tile London Transport Executive lest you disturb their "Public Relations." a similar greeting to another "The Torch." 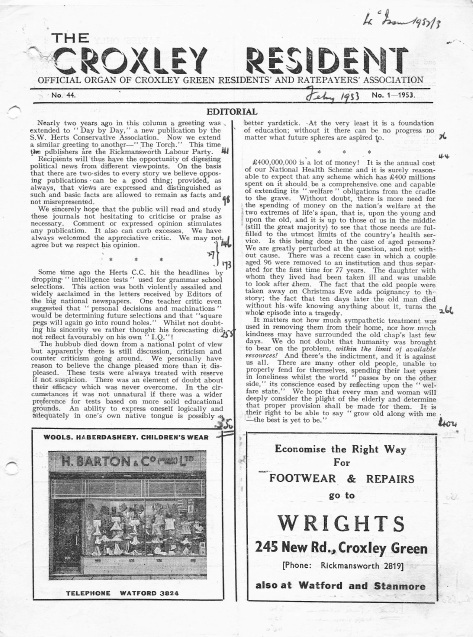 This time the publishers are the Rickmansworth Labour Party Recipients will thus have the opportunity of digesting political news from different viewpoints. On the basis that there are two- sides to every story we believe opposing publications· can be a good thing, provided, as always, that views are expressed and distinguished as such and basic facts are allowed to remain as facts and not misrepresented. . . We sincerely hope that the public will read and study these journals hot hesitating to criticise or praise as necessary. Comment or expressed opinion stimulates any publication. It also can curb excesses. We have always welcomed the appreciative critic. We may not agree but we respect his opinion. which such a heavy price is paid. It is a fallacy to even think for one moment, that these services are free, although no charge may be made for a. specific call or service. Public services should be efficient and failure in this respect can be likened to a theatre performance where the public expect their money's worth. Excuses only make matters worse, the only difference between the theatre performance and the public service is, that the client need not patronise the theatre again. 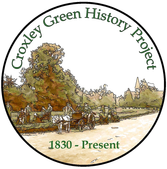 ​In early May, with or without the proverbial blossom, Croxley Green will be involved in council elections. 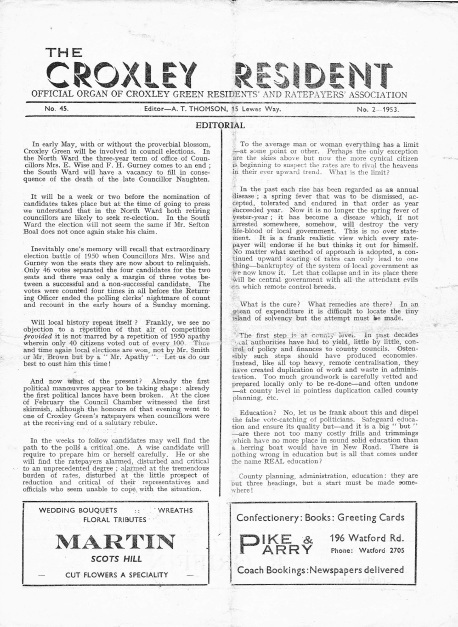 In the North Ward the three-year term of office of Councillors Mrs. E. Wiseand F. H. Gurney comes to an end; the South Ward will have a vacancy to fill in consequence of the death of the late Councillor Naughten. It will be a week or two before the nomination of candidates takes place but at the time of going to press we understand that in the North Ward both retiring councillors are likely to seek re-election. In the South Ward the election will not seem the same if Mr. Sefton Boal does not once again stake his claim. and is Chairman of the Social Committee. His reputation and activities in further "fields" is equally well known throughout the County, and the Herts. County Football League is to present him with a plaque in recognition of 15 years faithful and loyal service as a referee. He is, in fact, now in his 27th season as an F.A. referee. On March 21st a large number of residents and their friends enjoyed a pleasant evening dancing to the Andre- Simone Band. The success of the evening is proved by the sum of £5 10s. which was handed to the Flood Relief Fund". the transport authorities and then they would perhaps find that there were perhaps vested interests behind the requests they receive for such a service. 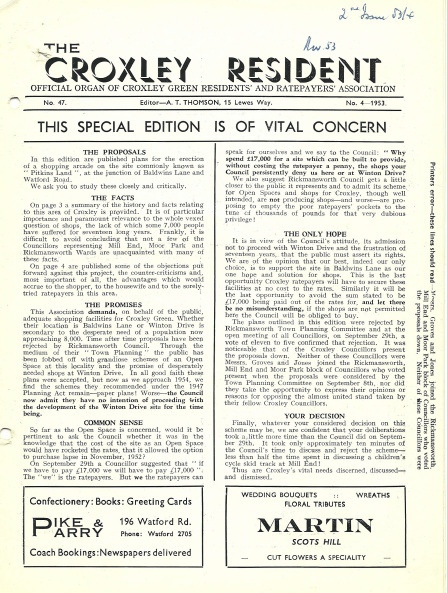 they have ever heard of Croxley Green." The County Education Committee has been under fire for having spent ratepayers' money on "Artistic Luxury" in other words works of art. It is only long term that a firm and final opinion could be given; meanwhile it is well that the Committee are reducing expenditure under this-heading. A study of library figures following the publication of Croxley Green Library issue details seems to confirm that television is rapidly ousting the library book. It will remain to, 'be seen whether the educational benefits are equal. Watford . Road. We ask you to study these closely and critically. 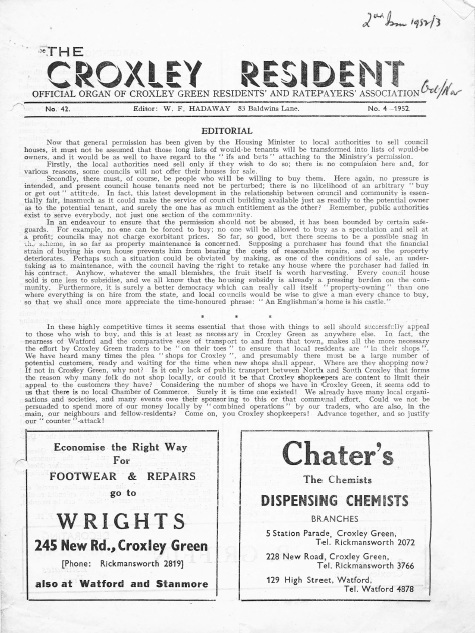 On page 3 a summary of the history and facts relating to this area of Croxley is provided. 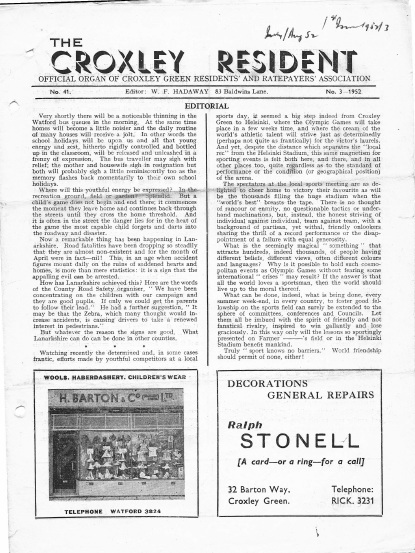 It is of particular importance and paramount relevance to the whole vexed question of shops, the lack of which some 7,000 people have suffered for seventeen long years. 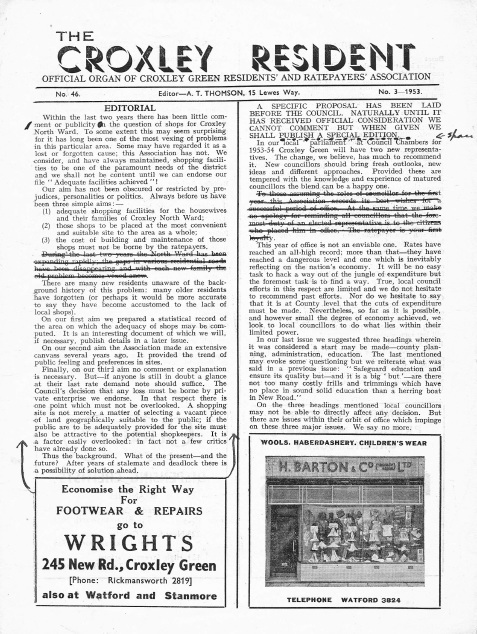 Frankly, It IS difficult to' avoid concluding that not a few of the Councillors representing Mill End, Moor Park and Rickmansworth Wards are unacquainted with many of these facts. .' , On page 4 are published some of the objections put forward against this project, the counter-criticisms and, most important of all, the advantages which would accrue to the shopper, to the housewife and to the sorely tried ratepayers in this area. of non-connection of the light columns on the Green by the Eastern Electricity Board, The Council are even considering invoking the Electric Lighting (Clauses) Act, 1899. Very appropriate.